How do I know if the product is authentic? Does HULA cover any tax and import duties for items to be shipped to an address outside Hong Kong? Can I return an item and get a refund? Do you show the original price of the Product? How do I tell the condition of a Product? Will items be cleaned before they are delivered to the buyer? Can I choose to view only Products that are my size? Can I ask further questions about a Product? How do I know if an item is giftable? Can I ask HULA to send an item as a gift? Do you have a store or showroom where I can try on items? Who do I pay once I purchased the item? What if I missed out on purchasing an item? What does 'Create An Alert' mean? What should I do if I haven't received the item by the date stated in the Shipping Confirmation? Can I track my purchases? How will I know if my purchase was successful? What does the status in 'My Purchases' mean? HULA is committed to its Anti-Counterfeit Policy and does not accept the listing of fake or counterfeited merchandise of any kind. Building a mutual trust and positive customer experience are at the core of what HULA strives for each day and thus, we exercise a zero tolerance policy for counterfeit goods. 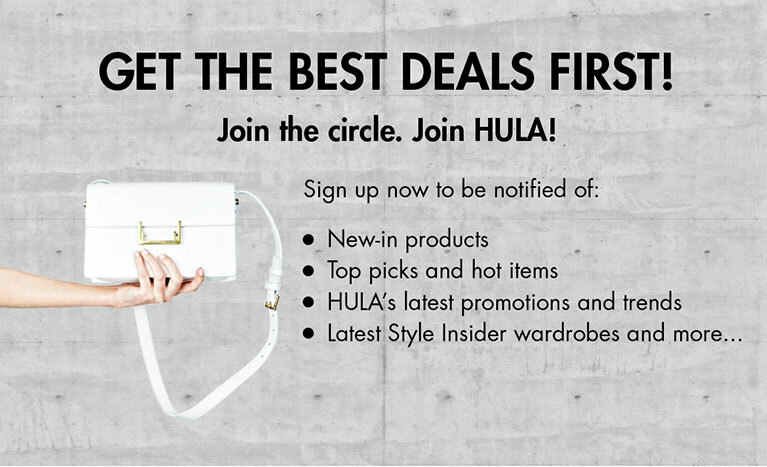 HULA will only accept for listing on the Website authentic new or pre-owned luxury goods. 1/ Once each item for sale is submitted, our team would undergo rigorous authentication process that includes request for submission of original proof of purchase (if available), inspection of details such as but not limited to brand stamps, serial numbers, stitching, material, care labels and hardware before the item is uploaded on HULA website. 2/ Before any sold item is shipped from our warehouse, our team would undergo another round of authentication and condition check. 3/ Payment to the original seller is withheld for a minimum of 28 working days until the buyer receives the purchased item and is satisfied with the item, including authenticity. In addition to above, HULA may also work with professional external authenticators and select luxury brands for further assurance of authenticity. In the event that you suspect an item you have purchased is a counterfeit, please email us at returns@theHULA.com for a free pick-up within 48 hours upon signing the delivery of the product. However, please note that original HULA security tag must be intact for each item and returned within the specified period. In the event that a returned item is indeed a counterfeit, HULA will issue a full refund with additional privileges such as store credits as our way of expressing our sincere apologies. BID is a new service which allows members to make an offer for the items they love but can’t afford. After you make an offer, you will immediately know whether your offer was successful. HOW DO I KNOW FOR WHICH ITEMS I CAN BID? Go to the top bar and click on “BID”. You can then view all items or shop by category. On any other shop pages, just look out for the disk where it says BID. Once you hunt down the item you wish to buy, click on the item and insert the amount you wish to offer in the pop up (the amount must be lower than the existing selling price). The system will immediately tell you whether you were successful. If your BID was successful, the system will let you know and add your item to your basket. You can then proceed to check out or continue to shop. Please note that until you have actually bought the item, it remains open to others to buy it, so better hurry before someone else buys it! and they will be automatically added to your basket. WHAT IF MY BID WAS DECLINED? If your offer was rejected, you will be asked whether you wish to BID again. You have 3 BIDs in total per item. After the 3rd unsuccessful offer, you will have to wait 14 days until you can BID on the same item again - so BID wisely! WHAT IF I NO LONGER WANT AN ITEM AFTER BIDDING? No worries, you are not obliged to buy the item after you have successfully placed a BID. The item will simply show in your account under My Inventory > My BIDs. You may delete the item from your account any time by clicking the ‘X’ on that item. CAN I VIEW MY PAST BIDS? Here you will see the date you last bid, as well as your last bid amount, so you can check when you should try to bid again. Yes. If you wish to return a refundable item and request a refund, you can do so in accordance with our existing refund policy. Our payment platform is powered by Braintree, a PayPal owned company, and secure. HULA does not store any payment details on the Website. If your shipping address is in Hong Kong, shipping is free. In general, if your shipping address is outside Hong Kong, please click onto the (i) icon next to Shipping Guide in each product description to check the applicable shipping fee for your location and approximate days for delivery. Actual rates will be applied once you check out, and if you purchase several items, the rate will reflect the number and type of items. Shipping rates do not include any import duties, taxes, levies or other charges that may apply in your country. HULA has done its best to obtain the most favourable shipping fees for Non-Hong Kong Buyers. If you feel the shipping rate seems too high, please email us on Hello@theHula.com to check. HULA will do its best endeavours to ship items to addresses in Hong Kong within 1-3 business days from issuance of the confirmation that your item has been dispatched. If the item is to be shipped to an address outside Hong Kong, shipping times vary. Please check the Shipping Guide (i) beside each product detail to see estimated shipping times. No. HULA does not cover any import duties, taxes, levies or other charges that may apply if items are to be shipped to an address outside Hong Kong. Please check whether any import duties, taxes, levies or other charges may be applicable before you purchase an item. HULA does not accept refunds if an item cannot be delivered to a buyer because import duties, taxes, levies or other charges have remain unpaid. Most items offered for sale by HULA are refundable. If an item is non-refundable, this is clearly stated in the details of the Product page of each item. HULA only accepts refunds for refundable items if the item is returned in the same condition in which it was dispatched to you and provided that HULA's tags are still attached to the item and have not been altered or temporarily removed from it. To request a refund, you must notify HULA within 48 hours from signing for delivery of the Product that you wish to return a Product. To notify HULA, go to My Account > My Inventory > Purchases; find the item you would like to return in the 'Refundable' column and click the 'YES' box; this will take you to a form. State in the form the reason for the return and a suitable time for collect of the item(s). Alternatively, you can notify HULA by email to returns@theHula.com. Once HULA has confirmed that you are entitled to a refund, HULA will arrange for a refund within 14 business days to the credit card that was used for making the payment. If you encounter any problems with your refund, please contact us at returns@theHula.com. For details of HULA's Return and Refund Policy, and on the returns procedure, please review HULA's Terms & Conditions. Currently we only accept VISA and Mastercard. Payments are made through our payment system, which is powered by Braintree (a Paypal owned company) at check out. Yes, if the original price is known to us. If known to us, the original resale price of a Product is displayed as a small number in grey that is crossed out. HULA only sells shoes that are in New or Hardly Worn condition (worn lightly up to 5 times or less). A majority of the items for sale have previously been dry-cleaned by the seller before handing them over to HULA. HULA will only get items machine washed or dry cleaned if necessary. HULA respects the planet. We therefore do not dry clean every time as standard practice because the toxins dry cleaning typically produces are harmful to the environment. Yes. Products can be filtered by size on any shop page after you have selected the category (i.e. clothing or shoes). Sizes stated are those stated on the actual label of the Product. Please note that the actual measurements of a Product vary between brands. Along with the size label, HULA tries, where possible, provide on the Product description page key measurements of a Product in centimetres or inches. We recommend you double check the size in the Product description before placing an order for a Product. Yes of course. Simply go to the Product page and click 'Request for more information' HULA will do its best to get back to within 24 hours. You must be signed in to use this service. HULA identifies items that are suitable for being gifted to others because they are in absolutely pristine condition and their packaging is also in great condition. To find giftable items use the filters under Trends and search for "Perfect Gift" to see the variety of suitable items . Now you can gift a loved-one a perfect gift for less and with just one easy click! Of course! Please email HULA as soon as you have completed the purchase, telling us that you would like us to send as a gift and what message, if any, you would like us to include. Your items will be delivered gift-wrapped with ribbon and a hand-written card with your message. Gift vouchers are now available, so you can give the perfect gift! Available in HK$300, HK$500, HK800, HK1000 (if shopping in another currency, once purchased, your voucher will be rounded up to the nearest five US$, €, £, ¥). For custom amounts contact HULA directly to arrange, before purchasing the card on line. 1. Gift vouchers do not expire - ever! 6. Item/s purchased under this Gift Voucher may be returned for an exchange for another item, however if the item is less than the voucher amount, no cash can be exchanged. 7. If using the site in another currency to HK$, the Gift Voucher will be sent in the currency it was purchased under (rounded up to the nearest 5). The Buyer should contact HULA directly after the purchase to let us know which currency you would like this card (unless it is in the same currency as purchased). 8. Gift Vouchers can be sent directly to your friend free of change, if the address is in Hong Kong. However if the address is a location outside of Hong Kong, HULA can send a digital version direct to your friends email address. If a physical version is required to be sent overseas, please email HULA directly after purchasing your Gift Voucher. 9. HULA can help you hand write a message at the back of the Gift Voucher, if required when you check out or simply email HULA after purchasing to let us know. We have recently moved to bigger premises in Wong Chuk Hang, Hong Kong where members may contact us to make an appointment. Here you can try on pieces as well as be the first to see items that may not have been uploaded on the site. You also may bring up to 8 friends, which will make shopping even more fun! Hula manages payments between buyers and sellers. HULA will pay the seller after the period for regular returns has expired and HULA has received payment from the Buyer. If the item you want is sold - no worries! Simply click onto the heart icon on any Shop or Product page of that sold item to 'Create An Alert', so HULA can let you know if the same or similar item comes in! You must be signed in to use this service. If the item is shows up as 'sold', you can save it to your Wish List by creating an alert (My Account > My Inventory > My Wish List). If the same or a similar item comes in, HULA will let you know by email. You can remove an alert by by simply deleting from your Wish List the item for which you have created the alert . Please inform us at Hello@theHula.com. Yes. You can see your purchase history by going to My Account > My Inventory > My Purchases. After you check out and make payment, you will receive an email from HULA to acknowledge receipt of your order. If you do not receive a confirmation after payment, please contact us at Hello@theHula.com. If your purchase was unsuccessful in any way, HULA will alert you by email and make the necessary cancellations and / or refunds of the order. PENDING - Your item has been paid for but not yet shipped. SHIPPED - Your item has been shipped, but not yet delivered. DELIVERED - Your item has been delivered to you and you have signed for its delivery. REQUESTING REFUND You have requested to return the item to HULA for refund or relisting (this must be done within 48 hours of signing for delivery), and you are waiting for HULA to process your request and collect the item. REFUNDED - The refund has been transferred to your bank account. 7. Coupon validity date is stated on the coupon or at the time you receive the coupon code from HULA. 7. HULA reserves the right to change the coupon terms and conditions at any time without any prior notice. 8. If using the site in another currency, the coupon code will generate the amount that your coupon is worth, using the most current exchange rate.